Figure 1: Our two robots preparing themselves for the their first demo in front of a large group of people. Synchrobots are randomly choreographed machines that attempt to move in synch with each other. The machine’s receive commands to start and stop their wheels, and as well the pause in between movements. Even though the two machines receive the same commands, the differences in weight, shape, and environment can cause the robots to fall out of synch. The machines execute the commands as they travel across the room, sometimes bumping into each other or bumping into walls. The randomness of the movements creates a perceived intelligence, though there is none. The machines may nearly hit a wall but avoid it at the last second, it could be interpreted as very intentional, but it is the human interaction that creates these stories. These randomized in synch movements create life for these machine’s and make users delighted in following what they will do next. Figure 2: We had a huge range of ideas from the beginning. We did manage to keep the idea of duality in our final project. We began the ideating by talking about how we could affect machines using outside data, for instance, using the data of the amount of people passing through the OCAD doors, or the wind at any given moment in Antarctica. We began developing an idea to make bots that would rove around and crash into things. Their construction would be of two pieces of steel that could crash together and make a thunderous noise. However, the idea of constructing something that was made to bump into things with force seemed like a tall challenge, and possibly not one we wanted to tackle just yet. 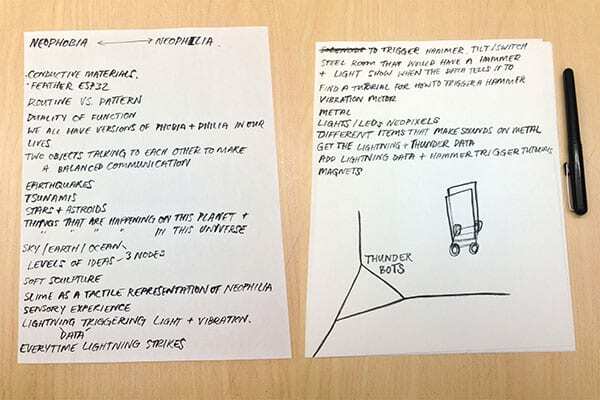 Figure 3: Quick sketches of how we could install our “thunder bots”. Next we had an idea to create bots that would find each other in the dark; our Marco Polo bots. 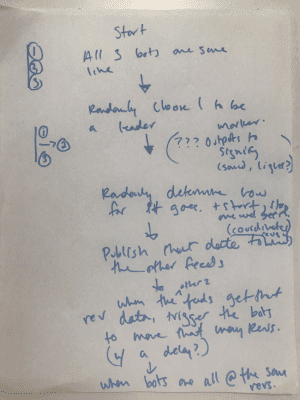 This was the idea that we began moving forward on: three bots that would seek and find another “leader” bot, then once it was found, another bot would become the leader. 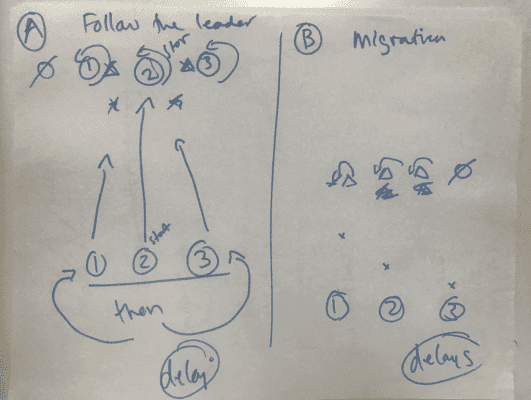 This idea lead into a thought about migration and how birds use this idea of passing around the leadership role so that the whole mechanism can stay strong. Figure 4: One of our initial process sketch for our Marco Polo bots. 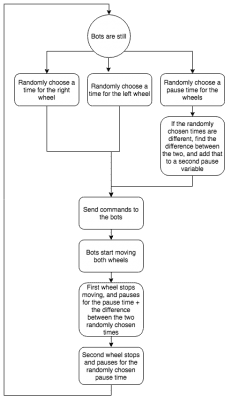 Figure 5: Our workflow written our for Marco Polo bots. 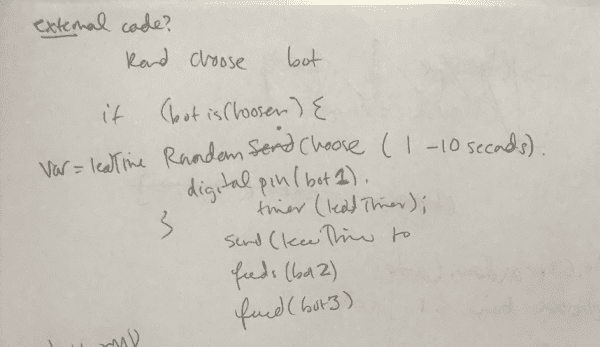 Figure 6: Our “pseudo-code” hand written out for Marco Polo bots. Figure 7: Our prefab bots were simple to put together, but made of very cheap parts. One of the DC motor gear ended up breaking inside of the casing and so we did an emergency surgery using another 180 degree servo’s gears. It was nice to take stuff apart and see how everything worked. We began with a trip to Creatron, where the array of wheels and servo motors was vast and costly. So we ended up bringing home a lovely red chassis kit that came with two rear wheels that attached to two DC motors and a stabilizing front wheel. It was a great place to start and getting the wheels working was proof that our little bot could move if we wanted it to. Video 1: A clip showing the robot moving with both DC motors connected to the feather micro-controller. Our first step in development was to find a resource for networking our robots that was not PubNub. Unfortunately, PubNub API was not able to receive any data that was published from an Arduino – users were only able to subscribe to data. Since our initial idea prior to Synchrobots, was for three robots to talk to each other by sending coordinates to the other, we needed to have a platform that would allow us to send and receive data. After some research, we decided to pursue adafruit.io to network our robots. Adafruit.io allowed us to very easily send and receive data through different feeds. 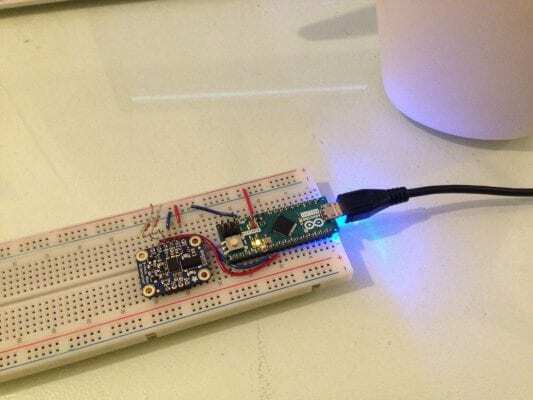 The primary issue that adafruit.io presented was that the account could only send and receive data up to 30 times a minute. This meant that we could not be continuously be sending or receiving data like PubNub. This presented some issues for our initial idea; we wanted our robots to be talking with each other continuously. Because we were developing for three robots that meant each one could only send and receive data ten times a minute. We discussed it amongst ourselves and decided to develop for an idea that required two robots that were not continuously sending and receiving data. As well we decided that if we changed our idea we would not scrap everything and start from the beginning. 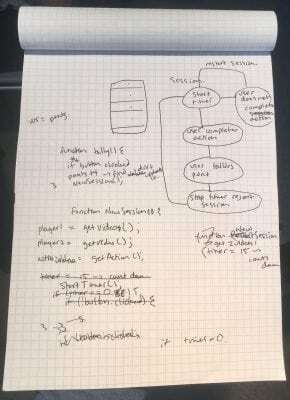 We would be able to re-use most of the code developed and thoughts from our previous hand written pseudo-code. Additionally, at this time we had purchased out prefabricated platforms for the robots. The movement of these bots was not linear, nor consistent. We decided that our initial idea of “Marco Polo bots” would not reflect well with these movements, and decided to pursue an idea that would allow the robots to move more freely. This brought us to the idea of Synchrobots: two robots that would receive the same data set, and execute at the same time. We were interested in how the robots would respond to the same data, and how the presentation of two robots would bring up connotations of partners, a couple dancing, or friends moving around. At the start of development, we found that adafruit.io has a feature that allowed us to view the data in a visualization that was being sent in real time. This was a very useful tool for our development since it let us see what values were being sent by each feed while the robots would be moving. We were not required to have our microcontrollers connected to our machines to use the serial logs. 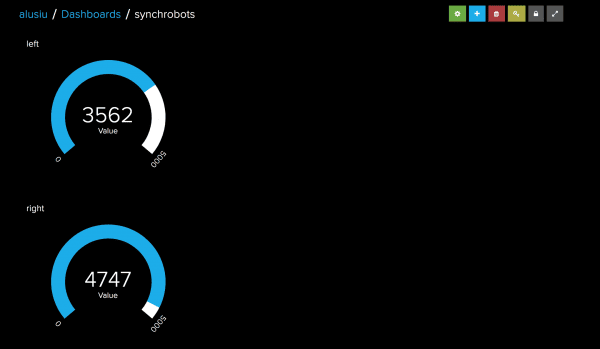 Figure 8: Adafruit dashboard showing a data visualization of the randomly generated times for our robots. Our prefabricated platforms came with two DC motors and wheels each. Upon purchasing we were certain that the motors in the case were servos and were surprised that they were DC motors in servo casing. The DC motors would have worked well, but they did not have a data pin. 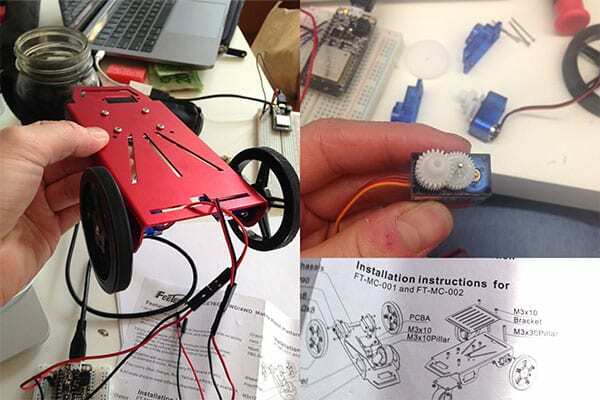 This posed problems for us as we needed to be able to command both wheels independently through the microcontroller. As well, the motors were very cheaply made and one of the gears broke fairly early into development. We took the motor apart and attempted to fix the gear by using one of the same parts from a servo we were not using. Figure 9: We attempted to fix the gear of our DC motor. Additionally, one of our feathers stopped working on us while attempting to control the DC motors; we suspect this was a power management issue that we were unaware of could happen. 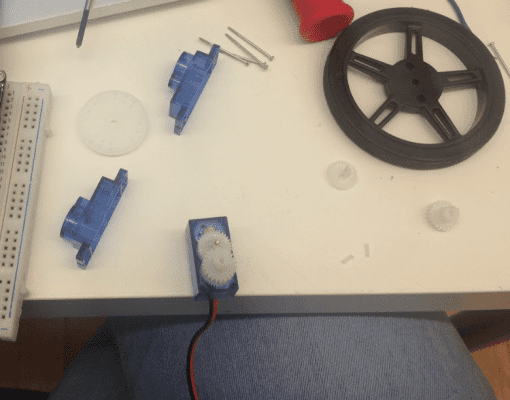 After a day’s worth of research, a feather passing away, and attempts of controlling the DC motors with our feather microcontrollers, we decided to get servo motors instead. 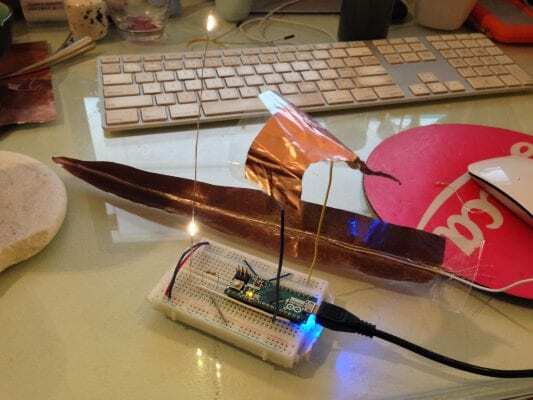 Figure 10: One of our feather microcontrollers stopped working during development. Unfortunately, this did not solve all of our problems. The servos were installed in a way that they were “flipped”. When executing code that would turn them on and off, the wheels would turn in opposite directions. The next issue to tackle was finding out how to rotate the servos in the same way. We finally found a solution that starts the wheels in opposite positions: one starts at 360 degrees and goes to 0, and the other goes from 0 degrees to 360. Video 2: A clip featuring both of our wheels spinning in the same way, and pausing in between times sent to the robots. Figure 11: Synchrobots process diagram. We wanted to use randomly generated times so that the robots would be anthropomorphized as viewers watched them. The random times would reduce that chance of patterns that viewers engaging with the robots for a long time could pick up. 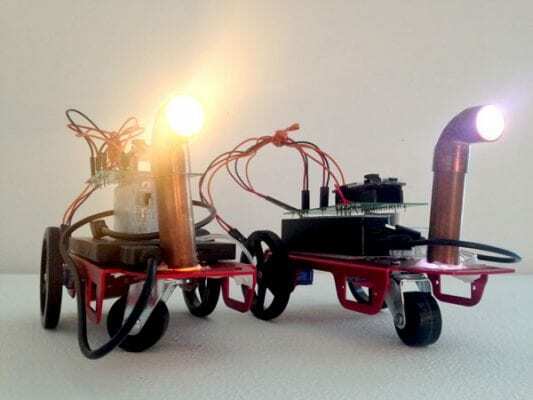 As well, we were attracted to this idea because we had been talking throughout the project of the character of machines that can occur through real life obstacles and variances, which became apparent in our little bots as we constructed them. One of their wheels was slightly wobbly, one of them was heavier because of a different battery pack. All small details that would make the real life outcome slightly different between the two. Figure 12: Deep in thought with the code and circuit construction with the servos. Next we began soldering the circuit, a simple one at that. 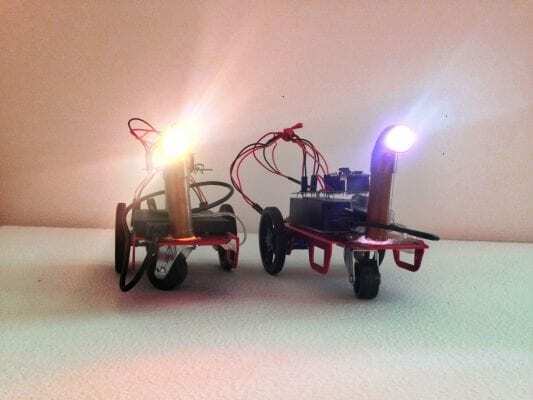 Something we also had in our plan initially was to add in blinking LEDs to the robots and possibly a robotic chatter with a speaker, as if they were talking to one another while they were roving. Near the end of the process we realized that it may have been too much for this one project and decided to keep this on for further iteration at another time. 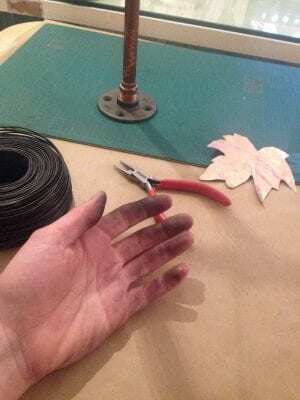 Figure 13: Soldering the circuit; picky, fun, detail work. Once we had our components soldered we discussed the casing for the microcontrollers. Our debate amongst the team was how to keep the robots looking industrial, while also adding in features that elevate the anthropomorphized qualities we wanted. 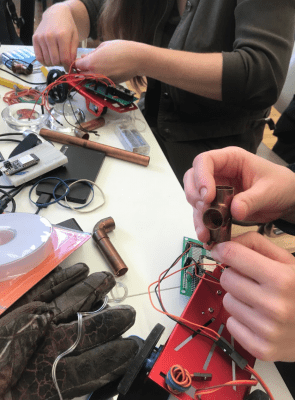 We thought that having an entire casing that hid the wires and the microcontrollers would create too much of a connotation of critters, while leaving the bare bones hardware would look unintentional. 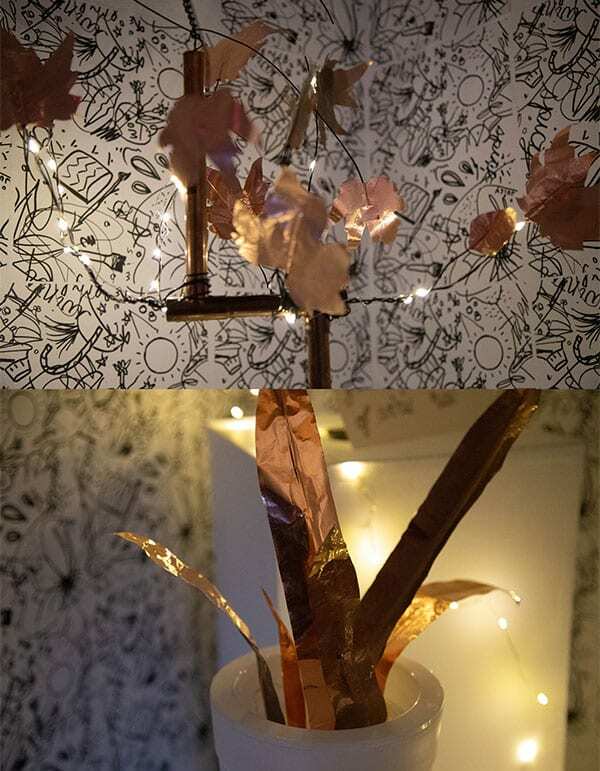 We had some spare copper tubing and LED fairy lights around the studio. We experimented to see how adding some more industrial material onto the robots would change the experience of the machines roving around the room. 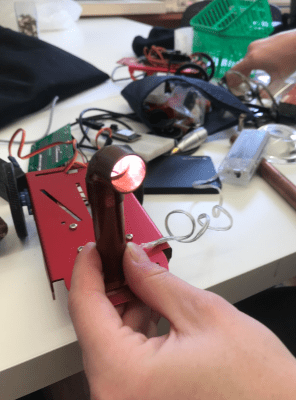 We placed the copper tubing in the front with LED lights and found that it resembled an eye. This was the perfect middle ground between robot and critter. To compliment the front, we cased some of the wired in copper tubing in the back. We had two types of LED lights, one “cool” strip and one “warm” strip. We decided, that to create small differences between the two robots, to have one robot that would house the cold strip, and one that would house the warm strip. Figure 16: Synchrobots ready and waiting. 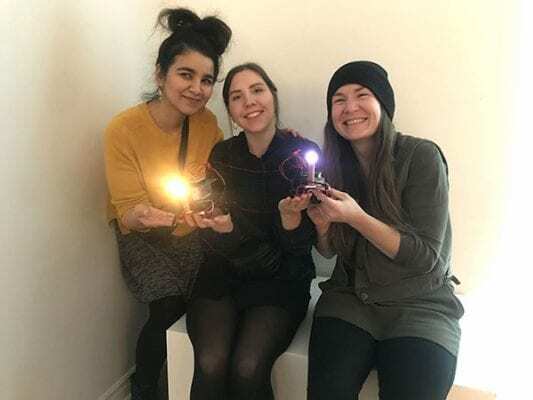 Figure 17: Team of Amreen, Olivia and Lauren holding both finished Synchrobots. A work that provided a larger context for this work is Lichtsuchende: Exploring the Emergence of a Cybernetic Society by David Murray-Rust and Rocio von Jungenfeld. A project that created a community of robotic beings that interacted through light. The project examined how we as humans can design for other beings, namely, machines. It is a beautiful project that went through many iterations of how the robots reacted in the space and learned from their behaviours and group patterns. Demoing our Synchrobots was a success. They seemed as if they were dancing at some points, they roved around separately, they even crashed into people and walls. It was a wonderful display of human and machines interacting. Peopled were delighted by them, some didn’t know how to react. It was a similar experience to watching people interact with a baby; some people were overly cautious and timid about the interactions, while there were others that actively and playfully interacted with the bots. We received overall positive feedback and great advice on how we could carry our project forward. After the demonstration of our bots, Kate (Hartman) suggested that we could harness a Go Pro camera on the wall and have it observe the bots as they move about a room until the battery ran out. This is something we might like to pursue to track the patterns of our bots through time and space. As we saw from the reactions of the our classmates, the movement and the meeting of the bots was such a cause for delight. Some other suggested direction was to look at LEGO mindstorms, which are tiny bots by the LEGO company that come as LEGO hardware with a preinstalled software. Nick Puckett had a thought to look at electric toothbrushes and dissecting them to get the vibration motors which would lead to creating small “dumb bots”. There were more suggestions to attach a pen or a marker to the bots as they moved around the room, as a look into bot art. 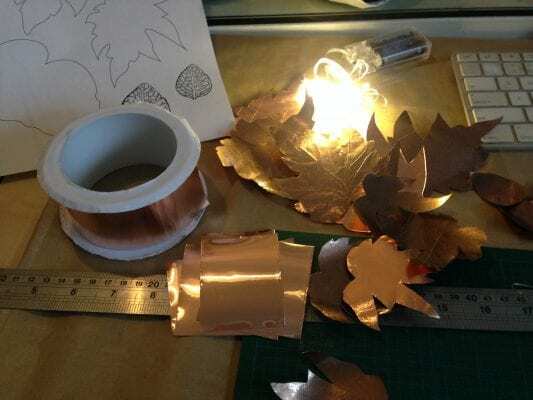 This idea of letting the bot create work through movement was interesting because we had looked at a similar project while researching and decided against it because there were many such projects. We wanted a free flow movement of the bots without having a purpose attached to the movement. The feedback we will next implement if we do take this project forward is thinking about interactions between these machines. During this project we explored the concept of interactions via using LED strips. We got the LEDs working but we hadn’t coded any interactions on how or what the LEDs would do to react when the bots interacted. This point would be the most crucial in the further development of the project. Šabanović, Selma, and Wan-Ling Chang. “Socializing Robots: Constructing Robotic Sociality in the Design and Use of the Assistive Robot PARO.” Ai & Society, vol. 31, no. 4, 2015, pp. 537–551., doi:10.1007/s00146-015-0636-1. Conference, RTD, Dave Murray-Rust, and Rocio von Jungenfeld. “Thinking through robotic imaginaries”. figshare, 20 Mar. 2017. Online. Internet. 26 Nov. 2018. Available: https://figshare.com/articles/Thinking_through_robotic_imaginaries/4746973/1. DeVito, James. “Bluefruit LE Feather Robot Rover.” Memory Architectures | Memories of an Arduino | Adafruit Learning System, 2016, learn.adafruit.com/bluefruit-feather-robot. Gagnon, Kevin. “Control Servo Power with a Transistor.” Arduino Project Hub, 2016, create.arduino.cc/projecthub/GadgetsToGrow/control-servo-power-with-a-transistor-3adce3. McComb , Gordon. “Ways to Move Your Robot.” Servo Magazine, 2014, www.servomagazine.com/magazine/article/May2014_McComb. PanosA6. “Start-Stop Dc Motor Control With Arduino.” Instructables.com, Instructables, 21 Sept. 2017, www.instructables.com/id/Start-Stop-Dc-Motor-Control-With-Arduino/. Schwartz, M. “Build an ESP8266 Mobile Robot.” Memory Architectures | Memories of an Arduino | Adafruit Learning System, 2016, learn.adafruit.com/build-an-esp8266-mobile-robot/configuring-the-robot. Grow you a jungle was created with the intention of bringing a little simple joy and life to the process of watering plants. 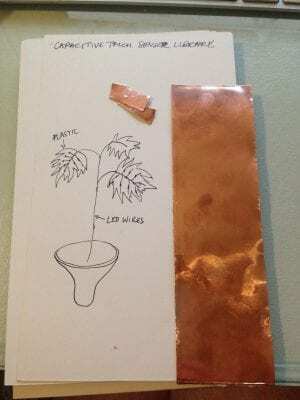 Taking care of a lot of houseplants you begin to think about the life and time of a plant. How the growth is hard to see sometimes, yet sometimes a rustling can be heard and the leaves are moving, growing, dropping. Seeing the significant growth of a plant can take time. Being in the woods or a jungle you notice the crashing noise and the movement of all of the life around you, creating a cacophonous hum of living. Indoors you start to forget how alive everything truly is. I wanted this project to bring a bit of the lush movement of nature to the indoors. Throughout the semester I had wanted to do a project that involved plants, but hadn’t found a group work that it fit into. 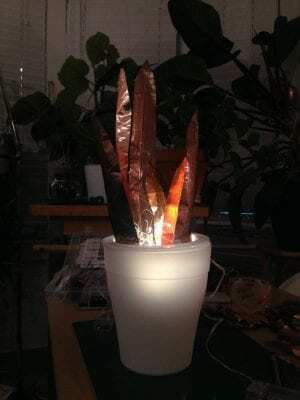 So I began to formulate an idea to involve a plant, the idea of time, and after using the orientation sensor, I realized that I wanted to examine the concept of movement and gestures. I am in a class currently called Experiences and Interfaces which has led me through a lot of thinking about movement and our interactions with the world through gestural action. I realized one night while putting off watering many of my plants how artificial this gesture of pouring water is. The houseplant market is booming, yet it is just a facsimile of the natural world. 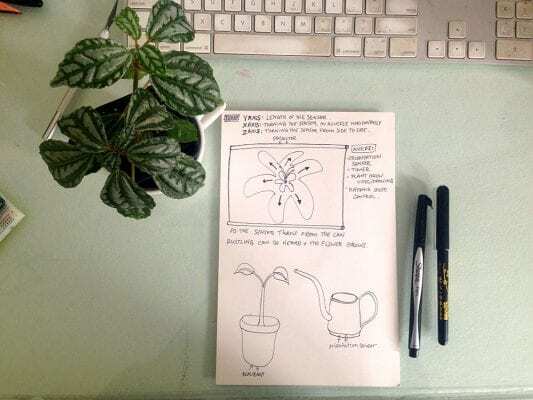 I began to think about creating a small simple experience that would enhance the idea of a plant growing from being watered, eyes and ears engaged. Projection has always been of interest to me, for its use of scale and darkness and light. An image of a dark room coming alive with the sounds of nature slowly creeping up at the action of a watering can feeding a garden came to mind. I decided to move forward and create. The process of creating the final video for the installation came through much iteration and testing. 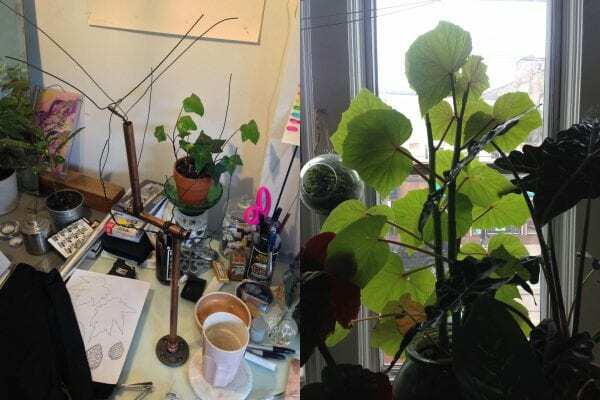 I made the decision to create it using found footage with Creative Commons licensing, since the timeline was too short for me to film my plants with any significant changes tracked. I wanted the video to have a lush ephemeral quality with lots of light and dark and movement. In my personal photography work I frequently create images using overlays and intense saturation and decided to use this same technique for the video. 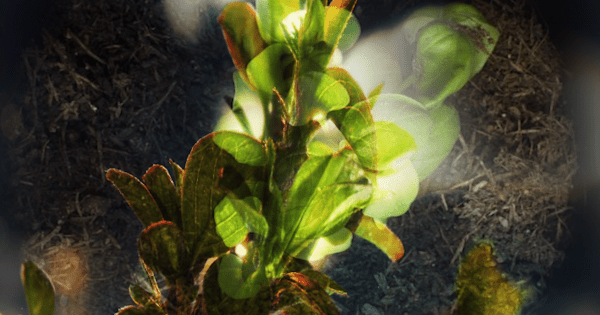 So I took to creating layers of plants growing in Adobe Premier Pro, this was a process of testing and tweaking. I used several opacity masks in the end to get the look I wanted. Below are some other videos I created before settling on my final. The sound portion of this project took huge queues from a website I found called Jungle Life, a user controlled jungle sound player. I spent a bit of time in the jungles of Costa Rica a couple years ago and have very intense memories of sitting in the rainforest listening to the deafening sounds changing and moving around me. I wanted this to be the sound that would be triggered by the watering can. So as with the images I found about 15 Creative Commons samples of jungle and forest sounds and took to creating a timeline of all of them in various levels of highs and lows. 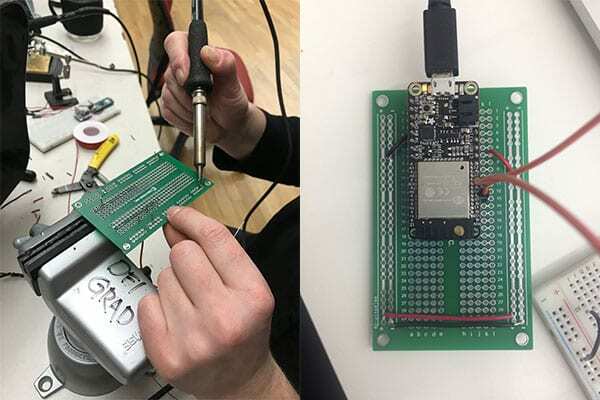 Initially when the project was announced I was a bit intimidated by the idea of creating the entire code and circuit by myself, but it was a much needed challenge and confidence booster in the end. I take very well to building on knowledge that I already have, so I decided to keep everything as tidy and simple as I could to tell the story I wanted. In class one day I set up the orientation sensor successfully and realized how versatile this feature could be. My final circuit ended up being this exact set up, taken from the orientation sensor tutorial in class. When setting up my board I ran into some problems, and could not figure out why it wasn’t working. After 20 minutes of pulling my hair out and rewiring most of the board…. I realized that one of the wires I had cut had split and wasn’t making a connection. A good lesson in checking the small stuff thoroughly. Building the code was the most intimidating part in my mind. So as with the board I built on some of the code that had been provided by Nick and Kate. I began to slowly break down each line and what it mean and how it functioned. 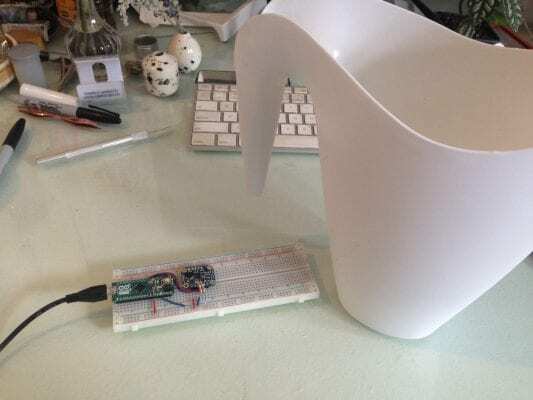 I did several Google searches to assist in writing this code and as had been mentioned there really is no search for “How to make a watering can trigger a video”. I honestly didn’t even find much for “How to make an orientation sensor trigger a video”. There was however many pages of documentation about using Processing to do this. It seemed like a big task to switch the language at that time, so I decided to proceed on using P5. My realization was that what I would have to write is an If/Else Statement. Which I did successfully, or so I thought. But it wasn’t triggering the video. And after another couple hours of painful searching I posed the question to my classmates. One noticed that I hadn’t been using the draw function, this had been intentional initially as I just needed the video to play on the screen, but I hadn’t taken into account the action that would need to trigger and loop. So once I moved my toggleVid(); if/else function into the draw function, BOOM! It worked. This moment felt like I had won a medal. Something I keep learning every time I code is how tedious and time consuming it can be, and that the learning will never end. Persistence and variety in method is surely the key to this one. I have been ruminating for a couple years on the Québécois NFB short film, “The Plant”, directed by Joyce Borenstein and Thomas Vamos. 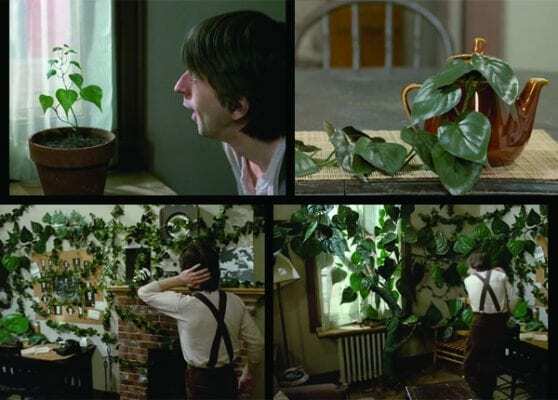 It is a beautiful film that delivers a timeline of obsession through the relationship of a man and a plant and was filmed in my old house in Montréal. Something that I kept remembering about this film was how the plant’s movements turn from joyous to vicious and wild in the time it would take to see a small amount of growth in a real live plant. Which lead me to think about how when you take a time lapse of a plant you can see exactly how wild and alive the growth really is. Another project that lent some inspiration was the wonderful art group teamLab from Japan. They create incredible immersive experiences using digital technologies and huge real life installations. They believe that the digital world and art can be used to create new relationships between people. By using interactive work that responds to the users movements they achieve this. 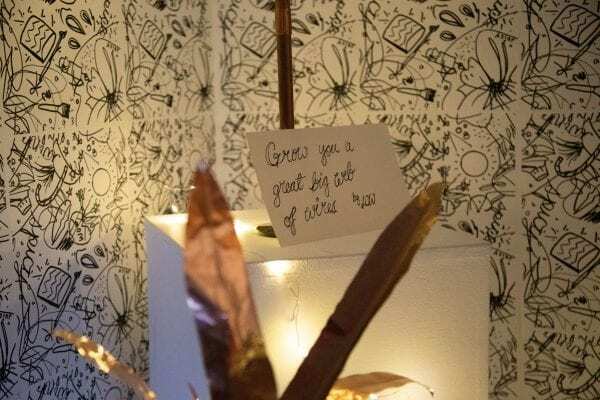 I am interested in creating simple installations in my own work that will make people reflect on their place in the world and how the interact with it, the small, magical changes that can occur when you make a action or decision. 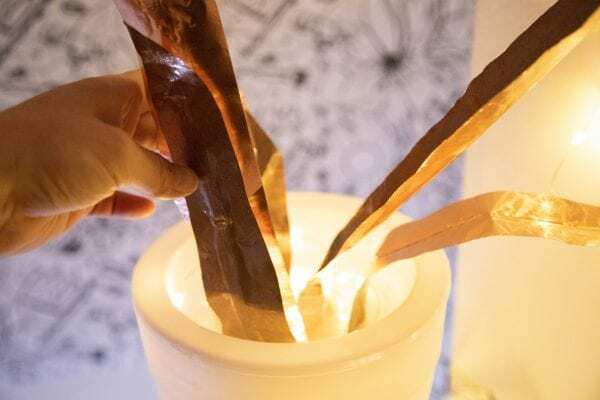 One of their projects below uses projection to a tea ceremony that bring life to the process. Another overlays projected animals in a natural environment to make the user contemplate our place in the world and how we may be the top predator of the life cycle. This project began simple and stayed simple, but I do not think it lessens its value and success. I am very happy with the outcome and am hoping to come back to this idea of triggering growth in the future. In the final presentation there were some wonderful comments of refining the way the sound and video reacted to the movement, I am banking these for future iterations. Something else I wanted to explore was how scale could amplify the feelings that this project evokes. 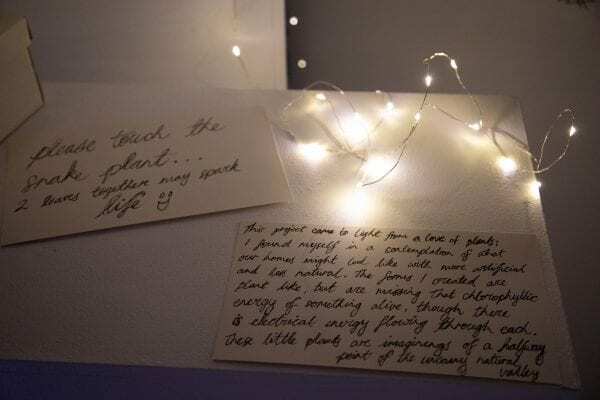 Possibly using a whole room filled with plants and using projection mapping to sculpt the way the videos look and feel. The more we build technology into our daily lives I become more aware of our need for natural life. Exploring this idea further is going to make the world we live more whole and will allow sustainable living ideology to flow into our making and ideas more freely. “Adafruit BNO055 Absolute Orientation Sensor.” Memory Architectures | Memories of an Arduino | Adafruit Learning System, learn.adafruit.com/adafruit-bno055-absolute-orientation-sensor/processing-test. “Adafruit BNO055 Absolute Orientation Sensor.” Memory Architectures | Memories of an Arduino | Adafruit Learning System, learn.adafruit.com/adafruit-bno055-absolute-orientation-sensor?view=all. “Free Forest Sound Effects.” Free Sound Effects and Royalty Free Sound Effects, www.freesoundeffects.com/free-sounds/forest-10008/. “Free Jungle Sound Effects.” Free Sound Effects and Royalty Free Sound Effects, www.freesoundeffects.com/free-sounds/jungle-10009/. Ir, and Stéphane Pigeon. “The Sound of the Jungle, without the Leeches.” The Ultimate White Noise Generator • Design Your Own Color, mynoise.net/NoiseMachines/jungleNoiseGenerator.php. Koenig, Mike. “Birds In Forest Sounds | Effects | Sound Bites | Sound Clips from SoundBible.com.” Free Sound Clips, soundbible.com/547-Birds-In-Forest.html. Koenig, Mike. “Frogs In The Rainforest Sounds | Effects | Sound Bites | Sound Clips from SoundBible.com.” Free Sound Clips, soundbible.com/251-Frogs-In-The-Rainforest.html. Koenig, Mike. “Rainforest Ambience Sounds | Effects | Sound Bites | Sound Clips from SoundBible.com.” Free Sound Clips, soundbible.com/1818-Rainforest-Ambience.html. teamLab. “Flowers Bloom in an Infinite Universe inside a Teacup.” TeamLab / チームラボ, www.teamlab.art/ew/flowersbloom/. teamLab. 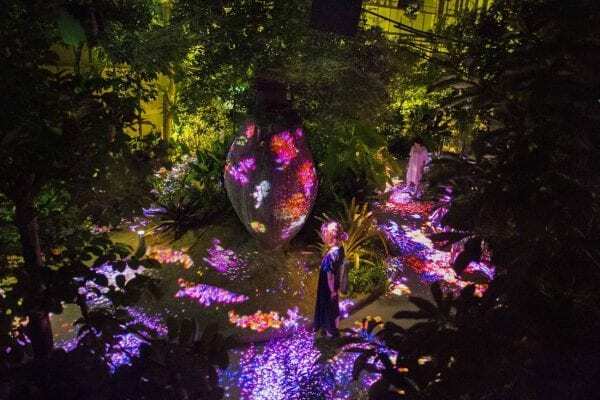 “Living Things of Flowers, Symbiotic Lives in the Botanical Garden.” TeamLab / チームラボ, www.teamlab.art/w/lives2018botanical/. Vamos, Thomas. “The Plant.” National Film Board of Canada, National Film Board of Canada, 1 Jan. 1983, www.nfb.ca/film/the_plant/. “Video.” p5.Js | VIdeo, p5js.org/examples/dom-video.html. 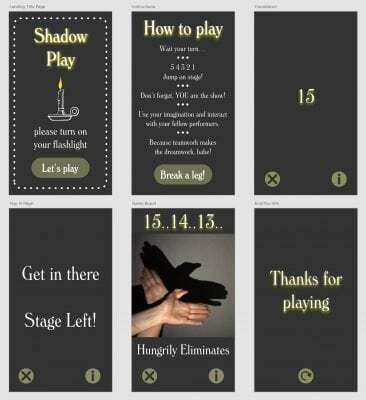 Shadow Play is an interactive web application that self-directs visitors through an improvised shadow puppet show on the go. 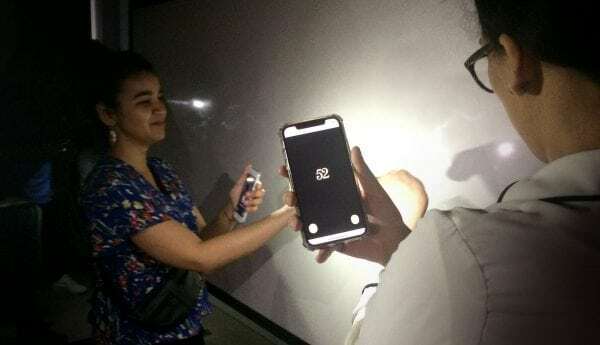 The application uses the participants built-in flashlight functionality on their phone to create a theatre scene where they may be. Shadow Play randomly generates wait times, performing times, performance cues, and shadow puppet actions every round for each participant. The randomly generated wait times and performing times stagger participants so that everyone is not acting out their shadow puppet at once and nor are they performing the entire time. The randomly generated cues are a combination of an adverb, verb, and a .gif image of a shadow puppet demonstration. Viewers are invited to interpret these cues in any which way they prefer, and are also encouraged to interact with the other performers near them. Shadow Play also requires audience interaction depending on the cue. Some of the shadow puppet demonstrations require both of the performers hands on at once. The performer will need to call upon an audience member to either create the demonstrated puppet with them, or alternatively for the audience member to hold onto their phone and direct the light at their hands for them. Participants turn on the flashlight on their upon entering the application. When the timer is up, a shadow puppet demonstration in the form of a gif, an adverb and a verb, and a new random timer between 20-45 seconds appears on the screen. Participants act out the shadow puppet in a collaborative group setting for the designated time. Once the timer is up, the participants screen returns to the previous timer screen with a new time between 20-60 seconds. If the user is ever confused about the instructions, they can return to the instructions page by clicking the “i” in the lower right corner. 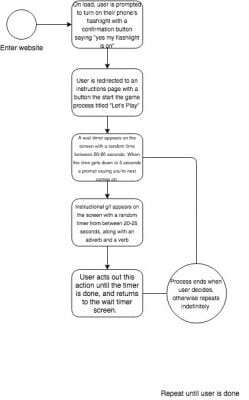 The process repeats until the user ends the game by clicking the “x” button in the lower left corner. We initially began talking about general project ideas that appealed to us, places that one might encounter lots of screens and ways we use multiple screens. We discussed and shared common interests and goals that we wanted to incorporate into the design of this project. Through documented conversations, the common interests were to design a product that would create a self-directed narrative while using the application, laughter and physical interaction amongst participants, moving the users around the physical space when using the application, and incorporating randomly generated data so that each user’s experience was unique and open for their own interpretation. More ramblings of the things that sparked creativity and ideas that we may want to shape our project around. 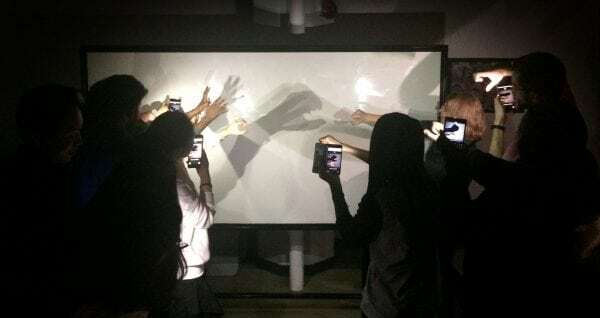 We tested a quick proof of concept by casting a shadow puppet onto the wall and decided to pursue the concept of creating an interactive puppet show that was directed through a web application. The decision was made after seeing the simplicity of the action, and how complex the resulted shadow could be due to the placement of the flashlight (farther away you could create bigger shadows, the shadow is affected by how many lights are around, etc.). The placement of the person and the light naturally encouraged movement and interaction which were on our list of desired project goals. Something that was exciting about this was the possibility for storytelling and childlike imagination. A big decision that was frequently discussed during our design process was how to direct a narrative in our product. Initially we decided upon creating a very explicit narrative experience. Our idea was to generate two shadow puppet demonstrations with a verb. The idea, though similar to our current iteration, was directed as a game rather than an improvised theatre application. The user would create the first shadow puppet on the screen, and act out the verb on the corresponding shadow puppet beneath the verb. The user would have 15 seconds to complete this action before the demonstrations and the verb switched to new options. If the user completed this action successfully within the 15 seconds they would get a point. We decided against this idea because we were not interested in making a game that was points based. It would deter from the fun nature of acting out the puppets. As well the concept of the game deterred from the act of shadow puppets; the shadow puppets were not required for the interaction, rather they were supplemental. Our idea evolved from this game though. 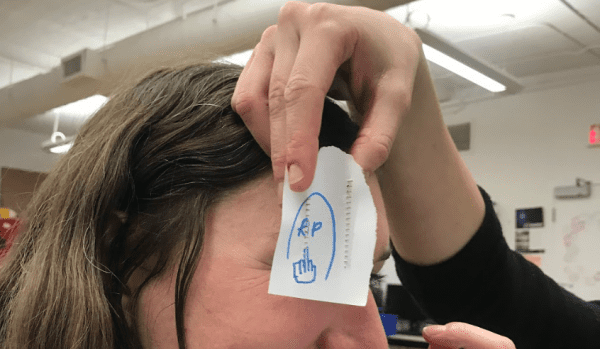 We decided that using one shadow puppet demonstration, a pairing of an adverb and verb, and a implementing a random time constraint allowed users to participate and create a changing environment. Everyone had a random time for waiting and performing the characters ensured that the theatre was always changing. 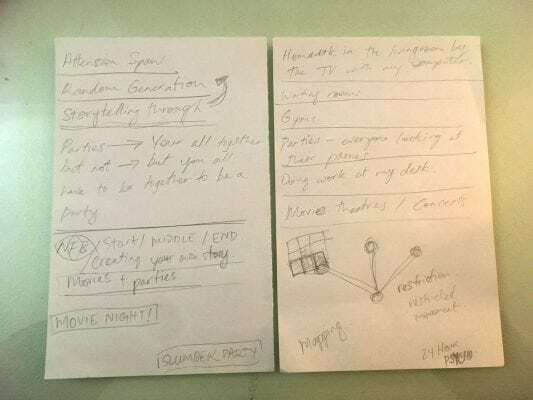 Our very simple MVP in the bottom right of this note took us from the initial stages of ideation to the final show. An incredibly valuable concept that I (LCW) found to be one of the most enlightening and useful concepts of the whole project. The workflow for the project was discussed immediately to determine the scope, tasks, and process of the project. 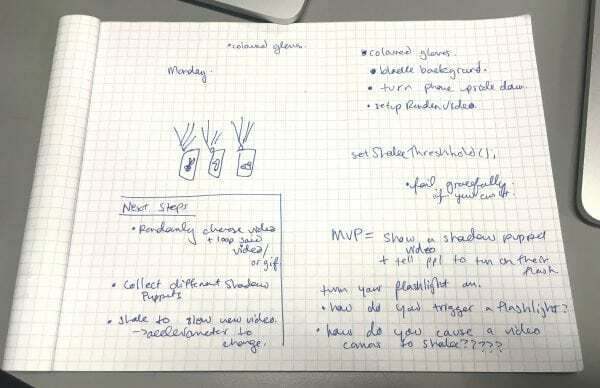 It was also discussed to determine what the minimal viable product (MVP) would be to achieve our desired product goals of having an interaction shadow puppet application. The workflow determined the next steps: prioritization of tasks, discovering what pages will need to be wire framed, technical requirements, and technical organization. From the workflow diagram we assessed all the tasks and functionality our product will need. We wrote down each task individually on a post-it note and drew out a calendar of the upcoming week. On the calendar we placed the post-it notes on the dates we needed to start the written task. 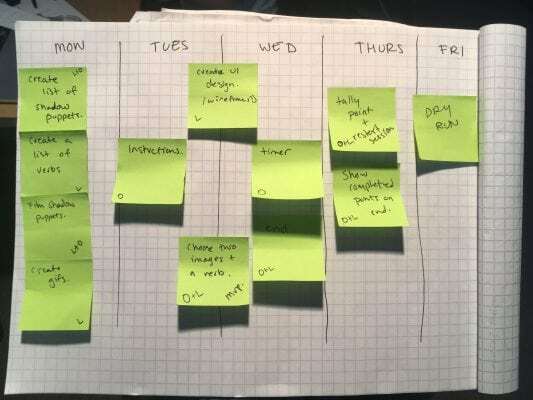 Post-it notes allowed us to move tasks around and and physically play with our schedule to determine which work needed to be done first and in which order to allow for the most efficient product completion. We placed each of our own initials on the tasks that each of us would lead. From the workflow diagram, we assessed the functions that were required for the project. We decided to use p5.js as our main library because it provided us with the functionality to create and style everything in a responsive canvas. The assessed functions were incorporated into the post-it note tasks placed on the calendar. We set up a Git Repository and created a development branch for push/pull requests. We used two types of wireframes: low and high quality. 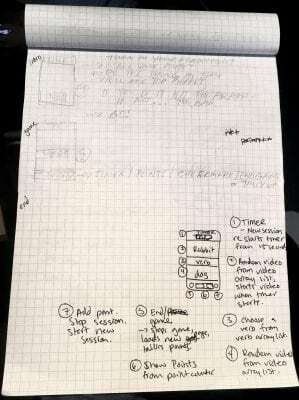 The low wireframes were sketched out to allow us to start the technical side of the project. 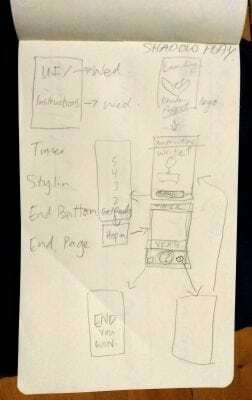 As we were developing the application we simultaneously started working on the high quality wireframes. Our process was to get all application functionality working first, and then to style the product once all of our elements were being rendered onto the page. Once the high quality wireframes were completed and the functionality was completed we applied the wireframes onto the product. 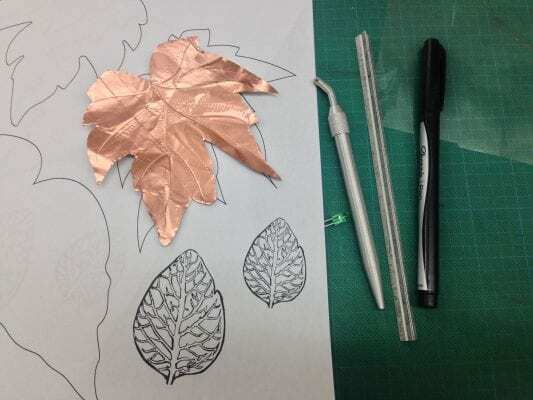 These initial drawings enabled us to move forward with coding while leaving the design and styling until after the bones of the project had been written. 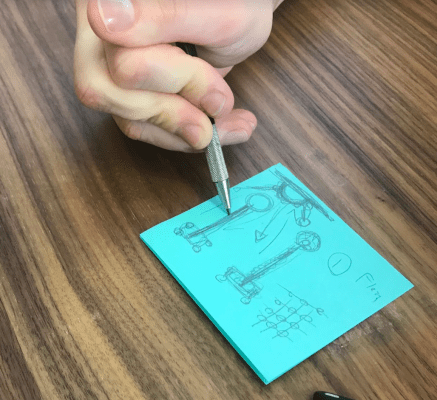 The low quality wireframes were simply sketched out so that we were able to iterate on the product workflow and freely think through drawing. The high quality wireframes were created using Adobe XD. Adobe XD allowed us to style a theme and an UI that was easy to understand for our users. The theme was inspired by old Charlie Chaplin movies, to place an emphasis on theatre and narrative. This was the final design. We decided to use the most simple design solutions to direct the user; using a classic silent film font “Windsor Condensed”, and a yellowish tint that was reminiscent of low light. We also required videos or gifs for our shadow puppet demonstration. We recorded and edited the images ourselves to have full control over our application content. Much of the building of this project was smooth (ish) once we had created our idea and laid out our workflow and wireframe plans. However, the most interesting part of this whole process, and where the project came alive was the demonstration and watching the users interact with this tool. All the joys of the idea, and user interaction flaws became more apparent. One particular comment from a user made me think about if our UI was efficient enough; while trying to play this game, one user couldn’t figure out why the image on screen wasn’t moving with their own hands, when in fact it was only an image and not a camera of what what going on in front of the phone. This comment along with a suggestion to pair this project with Augmented Reality was particular enlightening as to the possibilities of this project’s future. Some users took issue with the countdown timer page and suggested adding in a directive comment while the timer is playing, this was another comment that made us think a little deeper into the user experience of our design. This was a valuable comment in rethinking the whole flow of the play. Each moment must be directed and clear, even if the user is meant and encouraged to use their own imagination and creativity to play. This is a good example of a timer that is too long! Who wants to wait 52 seconds when everyone else is having fun. Another discovery that came clear when watching the group play the game was that the adverb/verb combination was, while funny, possibly not logically directing the user to do the action with their shadow puppet. Some of the word combinations were too vague or simply not able to be completed with the puppet. How would one “absentmindedly build” with a shark? The timer was another discovery that occurred with the user testing, there may be a more ideal time set for group play depending on the number of players. The time we had set for a group of 20 could be shortened for a group of 4, leading to another possibility of game play sets for different groups of people. Why could we not get our viewport to be responsive? The answer to this was discovered later and turned out to be an oversight that could be classed as a typo… We had forgotten to include our .css file in the index page. It is small trials like this that really are wonderful learning experiences to never forget to think simple and start from the beginning. Another challenge that we had was at the beginning of this process, which was actually nailing down an idea and sticking to it. We went back and forth on game play ideas and if it was the right direction to take this project. Would our players understand what to do? Is it a game? Do we tell people where to go? How to act? Do we get them to each act out a part in a story? These are all valid questions, but what we learned, is that simple planning is best. We spent quite a bit of time adding complexities that didn’t add to the play experience enough to matter. These two projects were inspiration for our final product. 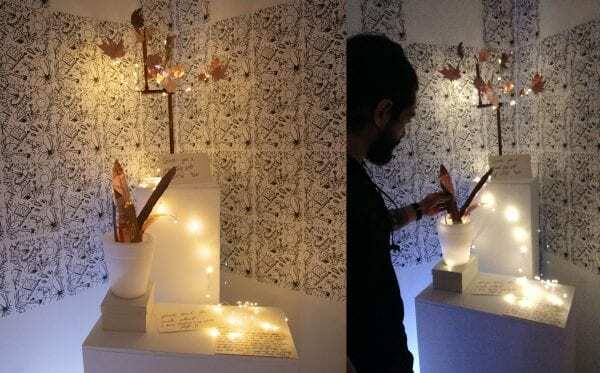 The first, “Guten Touch” by Multitouch Barcelona demonstrated a physical interaction of screens. The painting of the screens promotes physical movement as the participants actively paint the screen with the given paintbrush. This project was inspiration for our goal to get people physically moving in the space, and the use of darkness to encourage a sense of play and unrestrained play. 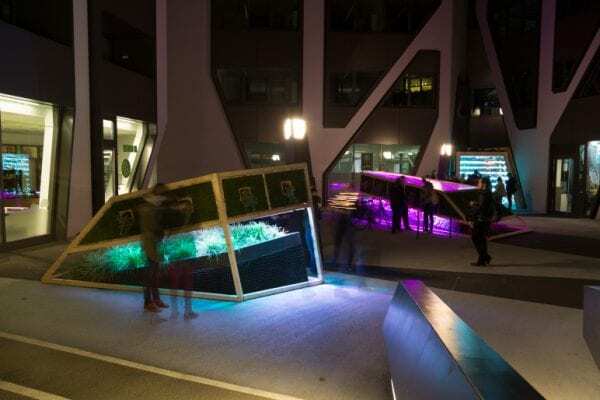 The second project #MIMMI is inspiration for the collaborative work of our product. #MIMMI takes on twitter user data from a city to create a display the responds to the mood of the tweets. Together the data creates a narrative of the city, and encourages group participation in the greater display. 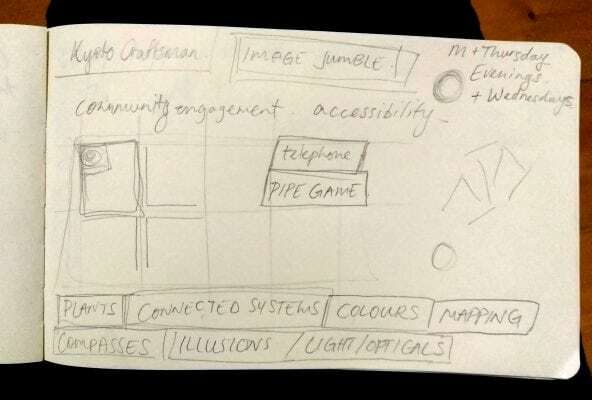 Our project reflects #MIMMI by prompting a collaborative canvas to create a an ever changing real-time narrative. The participation of the users is what creates the display, similar to #MIMMI. Armengol Altayó, Daniel and Multitouch Barcelona, directors. Guten Touch. Vimeo, 19 Feb. 2009, vimeo.com/3288753. “Barcelona 2008 – The Exhibition.” Red Bull Music Academy, www.redbullmusicacademy.com/about/projects/barcelona2008. Hu, Ray. “Talk to Me 2011: ‘Hi, a Real Human Interface’ by Multitouch Barcelona.” Core77, 20 Oct. 2011, www.core77.com/posts/20829/Talk-to-Me-2011-Hi-a-Real-Human-Interface-by-Multitouch-Barcelona. Multitouch Barcelona, director. Natural Paint. Vimeo, 14 Nov. 2008, vimeo.com/2240497. Multitouch Barcelona, director. Sabadell. Vimeo, 2 July 2012, vimeo.com/45056797. “Multitouch Barcelona.” IdN World, www.idnworld.com/creators/MultitouchBarcelona. Vilar de Paz, Xavier, and Marvin Milanese. “MULTITOUCH BARCELONA. HOW ‘HEAT’ TECHNOLOGY.” Digicult, digicult.it/design/multitouch-barcelona-how-heat-technology/. Vilar, Xavi. “Guten Touch.” Xavi Vilar, works.2783.me/guten-touch/.